The future just isn't exciting any more. We live in a world of wi-fi, widescreen, HD technology, carrying mobile phones in our pocket with more computing power than Apollo 11, wandering into air-conditioned offices to work on laptops and desktops. We listen to thousands of songs in boxes the size of cigarette packets. We can solve our problems with a touch of a screen. It's all become so... ordinary. Remember the thrill you got the first time you used an automatic door, how it was like being on board the Enterprise? Now you use them so often you're forgetting how door handles work. The future is now, and we're not bothered. Here's a tip: go to London. Every time I swoosh an Oyster card, I feel a little thrill of excitement at the genius technology of it. A wave of a piece of plastic, and the gates spring open for me; the correct fare is deducted, and the computer keeps track of how much I've spent to make sure I don't pay too much. If there's not enough money on the card, it contacts my bank and transfers some funds across. In split second, lightning fast time. It's so efficient, seamless and, well, futuristic, I've been desperate for it to be rolled out across the rest of the country. It seems it's now on its way to Merseyside. Starting Monday, Merseytravel began rolling out contactless smart card use. At first, it's just for concessionary pass holders (i.e. pensioners) and it's only on a handful of bus routes. However, the technology is being implemented further and further over the coming months, with the aim of making it available right across the county by 2012. Buses will be the first to benefit, but, according to the FAQs, the technology will start hitting the rail system next year. Marvellous. The paper tickets are increasingly archaic, and as for those big floppy Trios? Urgh. It's ridiculous that in 2010, you still have to wave a bit of paper that's bigger than your wallet, that gets creased and damaged and folded over. It's daft that you have to queue up every week so a new sticker can be applied to your card and get written in a book and stamped. It's like something from the Dark Ages. The sooner we have a microchipped smartcard we can renew online while we watch EastEnders the better. I do have a couple of caveats about it, though. The Underground benefits from ticket gates at almost all its stations, so access to the platforms is restricted. I've whined before about how great I think these gates are: they make stations and trains more secure, and they cut down on the amount of ticketless travel dramatically. These are a natural fit for the Oyster-style smartcard, a place for scanners to be located and a way to make sure people use them. Merseyrail doesn't have these gates, except in a handful of locations (the Loop stations, Hamilton Square, Conway Park and Southport, plus Arriva Trains Wales has them installed at Chester). Rolling them out across the whole network would be expensive. Not to mention the fact that not all stations are suitable for the works. Green Lane, for example, has a single booking hall with stairs leading to the platform: it'd be simple to block off the entrance with ticket gates. But how about Bebington, which has its tiny ticket office below the Liverpool platform? The ticket office is to one side, and the way to the trains is up a narrow slope in the open air - not the best location for ticket gates. Even worse, there's a car park on the Hooton platform, with direct access, so you'd either need a second set of gates there, or make people walk all the way round and under the bridge to get to the ticket office. Sadly, the brand new Sandhills also comes under this category - the ticket office is up on the platforms. Lack of forward thinking there, I feel. 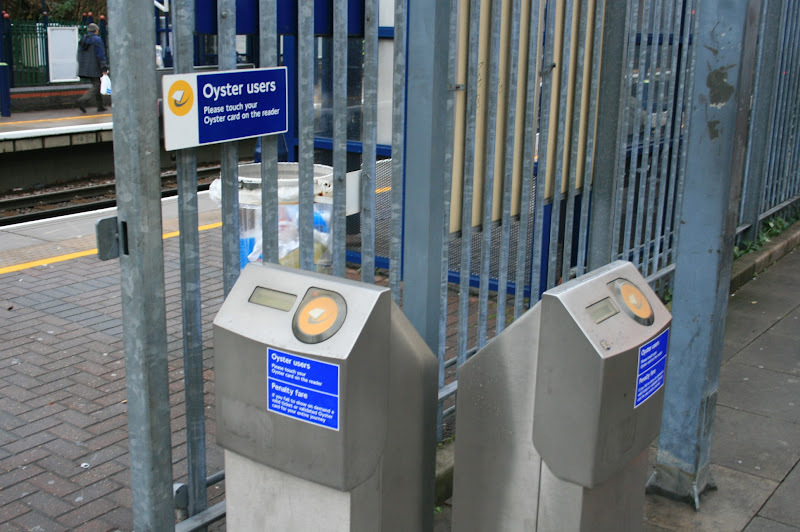 The solution will probably be the one used on the Docklands Light Railway, and at some Overground stations: no gates, but stand alone readers which must be touched in and touched out to register a trip. It's a bit more complicated, and doesn't have the security or ticket fraud advantages gating does, but it's a cheaper option and easier to implement. I'd personally like to see a mix of the two, with gating wherever possible (stations like Birkenhead Central and Port Sunlight leap to mind) and particularly in areas with high ticket fraud. Somewhere quiet like Capenhurst on the other hand just needs the odd reader. (And on a related note, let's hope the IT guys are better at updating things than they are now - I tried using a Saveaway on the Moorfields ticket barriers about a month ago, and they're still not recognised). The security issue leads me to a second downside of the smartcards: staffing. The Oyster card's been so successful in London, ticket sales at the stations have plummeted. This has lead to plans to reduce the staffing levels across the network too - in some cases, so much so that there will only be open ticket offices during the morning peak. The newest Underground station, at Wood Lane on the Hammersmith & City Line, was built without a ticket office: all sales there are through machines. Could Merseyrail go this way too? Permanently staffed stations are one of the best features of Merseyside's rail network, and are no doubt a large part of the Secure Stations accolades. I really don't want to see them end up like the miserable stations on the Ellesmere Port branch, boarded up and desolate. The MtoGo scheme could be rolled out, I suppose, to maintain the staffing levels and give them something to do, but that would be expensive and some places just aren't suitable for them. Back at Bebington, the ticket office is tiny (the queue regularly pokes out the door) - how would you fit in the range of MtoGo facilities? And could it compete with the parade of shops over the road? I like the idea of an 'M card' but I expect the threat or legal action by McDonalds would see that idea thrown out before it's even considered. Until I come up with something better, I'm going to go with 'Brookside'. I mean, if London can be so successful with a type of seafood, why not a doomed soap opera? The other reason they will never install them at all stations is that ticket gates have to have staff on hand at all times, from first to last train. Why its going to take Merseytravel 3.5 years to introduce a tried and tested technology is beyond me. On a related note TfL is phasing out Oyster cards next year and will begin just using bank cards. So by the time we get our own 'On the move' card - TfL will have phased theirs out! Well, there is one way to get around the whole gates needing to be staffed problem. How about they take the plunge and replace ticket offices at stations like Birkenhead Central and Green Lane with those ticket machines and then use the staff they already have working there on the new gates? Replacing ticket offices with machines as quickly as possible could encourage a lot more people to get the card (it would certainly make everyone well aware of it). Such a sudden change would be pricey though. By the way, Liverpool South Parkway is another station that has the ticket barriers installed already. Didn't realise it would be getting started as quickly as this week (albeit in a very limited form)! I am sure the unions would not be happy with that. All 'elf and safety etc. It'll never happen on Merseyside. Do we know what's happening with the City Line where single journeys can easily stray outside of the Merseyside PTE area? Or will the rail version of the smartcard only be available on Merseyrail operated services? Do we know what's happening with the City Line where single journeys can easily stray outside of the Merseyside PTE area? The smartcard scheme will eventually be rolled out nationwide -- the cards are designed to a standard (ITSO) which has or will be adopted by most public transport operators -- so in the long-term this may not be an issue. In the interim the situation may well be similar to that with Oyster - available only within the PTE area (and just outside in some cases) but if you're travelling to/from places outside of Merseyside, it's back to paper tickets. Thanks, Robert. I guess it wouldn't be too difficult to extend to maybe Bryn and Wigan North Western, but it strikes me that the southern Liverpool to Manchester route might be a bit trickier as I can imagine there's quite a bit of commuter flow centred around Warrington Central. I agree with the idea that each station is different and so ticket barries may only be appropriate at a few stations. I do, however, feel that they're a good way of avoiding fare evaision on should be installed wherever practical. The fact that they're already installed at the most important stations means that people already encounter barriers at least once on whatever journey they're making, whether at the departure station or the arrival station. Ticket barriers also need staff to be there incase they go awry. This can be gotten around at stations only staffed part-time by leaving them open when no one's there. I can't say I'd be keen on whipping out my debit/credit card in a train station late at night. Not to mention my entire wallet. New York is trialling the contactless Visa cards even as we speak, but I don't trust it: I don't trust the banks to limit the amount of money taken out of my account in the same way that Oyster does. Plus this raises the issue of what do you do for people without bank accounts, without access to those cards, and, for example, the under 16s who get free travel on TfL services? Having it alongside (as it already is in London, in fact, with an Oyster Barclaycard) would be the way for me. As for the barriers: as has been suggested, making the ticket staff barrier staff would seem to be the way to go. It's not ideal, I agree, and as has been pointed out, the unions probably wouldn't like it. How long has LSP had ticketing gates? They didn't have them last time I was there. Are they two separate gates (one for City, one for Northern Line), or one mahoosive barrier stretching across the whole station? LSP has had barriers for at least a year, I think maybe longer. There are two separate lines of barriers for platforms 1-4 and 5-6 - the only way it could have been done really given the station's layout. 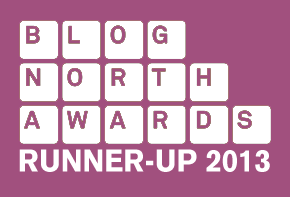 I discovered a particularly stupid bit of programming when I changed trains there a while back - my ticket operated the City Line barriers correctly, but was then rejected when I tried to get through the Northern Line gates. The staff member who waved me through the side gate told me that this happens to anyone who tries to cross from one side of the station to the other. They may have fixed it by now, and it wasn't a major problem, but did seem a bit silly. Merseyrail barriers are stupid - they're too slow and don't even accept railpass season tickets. (Except Lime St, of course, which is set to accept absolutely anything.) The big problem with putting ticket staff on barrier duty is that not all tickets are available from the machines (rovers, rangers, etc.) and this would effectively remove the income made through penalty fares as everyone would just say they wanted a ticket they couldn't buy knowing it's against the rules to issue a PF in such circumstances. Plus they'd also lose ORCATS income from advance purchase tickets. AFAIK TfL has no plan to remove the Oyster name or system - particularly since they've just paid £1million for the rights to them (it was developed by a private firm who retained copyright). That's not to say they won't increase cross-over systems (dual bank cards, etc. ), which I heartily support - I wish my bank offered it! Similarly, the cost has so far been the biggest limiting factor outside London - it might be tried and tested technology but few places have had the budget or the footfall to justify it. 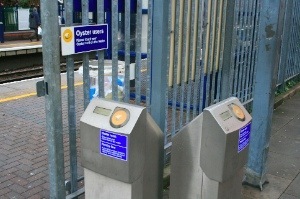 Finally from me, Oyster PAYG is now accepted on lots of journeys outside the TfL area and can be processed as normal, so there would be no problem extending it to Warrington or Wigan trains - as long as all stations and conductors had suitable readers. Merseyrail barriers are lousy (one day I'll take note of which ones keep your finished ticket, and which ones give it back to you - yes, this sort of thing concerns me). They clearly got them in a TfL yard sale - one of the ones in Lime Street even had an Oyster symbol on it. If Merseytravel really do push forward, they can help to dictate the standard: I can see the Liverpool system being extended to Halton, who work closely with Merseytravel on a lot of issues, and from there to Warrington and WIgan. They could pre-empt the GMPTE, and effectively force their system to be compatible with ours (which, let's face it, all all the systems should be). It also means that we could be stuck with an outdated system, but I'm willing to take that risk! I had the dubious pleasure of usinbg the C2 on Friday to go down the Pier Head for a meal, when at Queens Square 15 odd OAPs got. Oh what a work up. Half of them just walked on only to have to be shouted back to scan there pass, which all had to be taken out of there Merseytravel issued wallets. Then wait for a ticket to be issued. I appreciate alot of this is education, but it took an eternity and even the ones who knew still took forever. The C5 (or rather its predecessor, the 200) was my regular bus home from work when I lived in Dingle. If I still lived there now, I could be at the forefront of the smartcard trial and be on the cutting edge (and not because the threat of a stabbing is a daily worry in Dingle). There were always a lot of OAPs trying it on in the morning peak when I used the bus. Have Cumfybus's ticket machines been programmed to say, "it's before 9.30 but I'll let you off just this once"? You need to have a ticket issued after having the card read? Doesn't that kind of defeat the point.